Jeff, 59, from Middlesbrough, is a volunteer with Sporting Chance, which engages older men in activity and exercise groups. There is something for everyone from walking football to arm chair exercise, Aquasize to reminiscence sessions, cycling, gym, outings, table tennis and healthy cookery to name but a few. “Many years ago I was an employee at British Steel at the blast furnaces, when I had a serious accident at work which left me with permanent injuries. This led to long term mobility issues and effectively ended my career. My wife was pregnant at the time and through the shock, lost our child. I was at my lowest point at that time and even considered ending my life. For many years I was in and out of hospital. My mobility improved for a time and I was able to get out and about. I used to go fishing a lot with my son. Then five years ago my health deteriorated again and I was back in my wheelchair. I found my health issues and the loss of my mobility very depressing, often feeling quite low, and to combat this I started looking for something else to do. I moved to Bellamy Court Sheltered Housing three years ago, and it was there I became aware of Volunteering Matters when they came to speak about their Sporting Chance project. I signed up for the group, and after discussions with the team, volunteered as Chairperson for the group. I’ve definitely increased my confidence since I started volunteering and I’m told I have good people skills, am good at engaging people, and using my sense of humour to make others feel at ease. 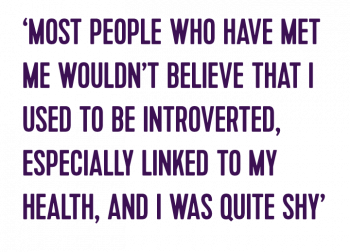 Most people who have met me wouldn’t believe that I used to be introverted, especially linked to my health, and I was quite shy. The main challenge that I’ve found in volunteering has been losing members of the group as older members have passed away and in getting others to join the group. To combat this I’ve now got some flyers and posters that I intend to distribute in the local area to raise awareness of Sporting Chance at Bellamy Court.